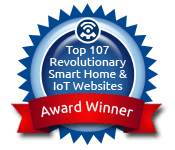 8 Must-Have Devices for a DIY Home Security System - Electronic House ​​ . Oh, you may also want to call your insurance company. They may actually give you money or discounts for having some type of alarm system installed. Security Can Be Part of a Bigger Package. 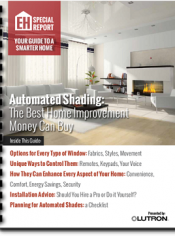 Security is easy to tie into a larger home automation system, especially lighting. If you currently have smart devices or want to add them in the near future, make sure that your security system is compatible. Wired vs. Wireless. Hardwired systems have always ruled the security roost. However, there are a lot of great wireless options out there these days. In other words, don’t assume that adding security will require massive holes in the walls. That said, you should also know that most wireless systems aren’t completely wireless. Many require a power source or other types of wired connections. It doesn’t seem like the most high-tech part of the security system, but it can be. Smart locks are all the rage these days. Some tie into a larger home security setup, while others work nicely alone — or at least in conjunction with a smartphone or other web-enabled device. When choosing a smart lock, consider the size of the lock, the functionality, and of course, the price. More about smart locks here. Control panels are more for the professionally-installed, rather than DIY home security systems. If this is going to be a high-tech system, it’s going to need a brain. The control panel monitors the activity from the various components that you’ll see on this list. Once something like a sensor or camera is triggered, the control panel can notify you or a monitoring company (if you have that option). 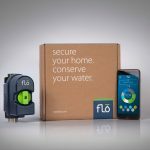 While not all of the products on this list require a control panel, it does tie together a complete system. There are plenty of hardwired and wireless options. ADT has specific control panels that can tie into other products and the company’s 24/7 monitoring service. Elk has the M1, a control panel that’s designed to work with several third-party systems. Honeywell also has a slew of its own options, including the pictured VISTA-21iP, which provides up to 48 zones of protection. If you’re going to have a home security system, you’ll need ways to access it. Many newer systems opt for smartphone and tablet control rather than traditional keypads, but we believe the keypad is still a very useful device to have. The one picture here comes from the Lowe’s Iris system, which you can read more about here. There are several different types of home security sensors. These are basically “switches,” which can trigger the alarm system in case of an emergency. Some sensors, like contact sensors, are designed to alert the system when a door or window has been opened. Some can even alert you to breaking glass or when water is present in a place where it shouldn’t be present. Once a sensor is triggered, it can alert your system to sound an alarm, send a text message, or even notify authorities. In some cases, the sensor can trigger cameras to start recording. 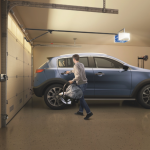 Despite being the smallest part of a security system, sensors are the most crucial. 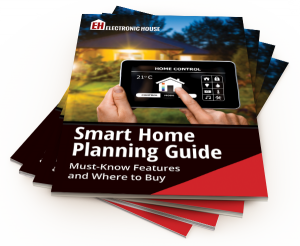 Just be aware that some sensors do require wiring knowledge to be installed and/or integrated into a whole-house system. 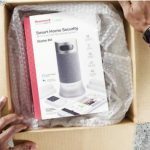 Of course, there are easy alternatives like the pictured Swann Magnetic Window/Door Alarm, which doesn’t require wiring and operates like a stand-alone security device with its own built-in audible alarm. What happens if an intruder slips past those window and door sensors? You may want to think about a motion detector. This is very similar to a sensor, except that it detects motion and body heat. Pets can actually trigger some motion sensors, so you may want to take that into consideration when buying one. However, if you don’t have a pet or need an inexpensive alternative, Belkin’s WeMo Switch + Motion makes for an affordable ($79.99), easy alternative. Just plug in the device and pair it with the lamp and the free WeMo app (read our review here). Users can set up the system to turn on a light, fan or other device once motion is detected. The system can also send out alerts, making it a nice compliment for a web-enabled device. A proximity sensor is a great backup device to have because it can automatically arm or disarm any system, or send you alerts to tell you that a family member (or pet) has left the house. Another good use of a proximity sensor is to remind you to arm your system. The key is to make sure you keep the proximity sensor with you (a key chain is a good place), otherwise it won’t serve its purpose. The one picture here is for the SmartThings system. Read our review of that system here. Smoke detectors aren’t just convenient; they’re also required by law. They can even be pretty high-tech. If the smoke detector is tied into a security system with monitoring, you can get a super-speedy response from police and fire departments. The newly released Nest Protect doesn’t work with larger security systems, but it does work with the Nest thermostat and a variety of web-enabled devices. The combination smoke and carbon monoxide alarm also has audible alerts, the option to silence the alarm with the wave of a hand, and a Pathlight feature for lighting your way in the middle of the night. Cameras have become a vital part of the home security setup. After all, who doesn’t want a peek at their home while away from home? 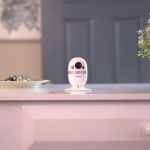 There are plenty of hardwired options, but stand-alone, web-enabled cameras have recently become a very popular security option. Both the Dropcam HD and Samsung’s upcoming SmartCam HD PRO (pictured) offer an easy alternative. Just place the camera wherever you want it, plug it in, connect it to your home network, and you can get a live peek at your property from any device with a web connection. Some stand-alone cameras even offer cloud-based storage for a small monthly fee. Read more about security cameras here. If you ask me, I’d say these are just a few from a list of many must have security devices and more so even the ones mentioned can be stylishly installed to avoid easy detection because some smart crooks would be looking for how to disable them whenever they get the chance. Thanks for the great run-down of DIY security systems. I’ve recently installed one in my house, and I was pleasantly surprised by how seamless the installation process was. I thought it would’ve been much more difficult than it actually was. I just have door/window sensors, control pad, and C02 detectors right now, but plan on adding surveillance cameras in the next couple months or so. Good one! Home security is a primary thing and intruder alarms help in home security. Your post is very informative. Thanks for the blog! Excellent! Home safety is the main thing and burglar alarm systems help in home protection. Your post is very useful. Thanks for the Article!